Partners in crime-prevention. A case of trial and error. The search for a good takeout. 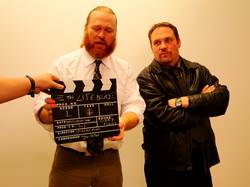 The Lite Blues is an ongoing buddy-cop web series by Wingless Films, and is the group's first multi-film series. It focuses on the misadventures of a pair of vigilantes, Victor "Vic" Turnbull (Julian Seager) and Allan "Al" Harrow (Boyd Rogers), masquerading as cowboy cops in their local neighbourhood. The series is written by Tom Menary and directed by Jim Elton, with visual effects by David Burbury and sound by Julian Kemp. The pilot episode, "The Slow Method", was released on 12th July, 2012, and was shot in Torquay with the assistance of John Tomkins and the staff of Dot's Pantry. Rogers during filming on "Dinner Date". 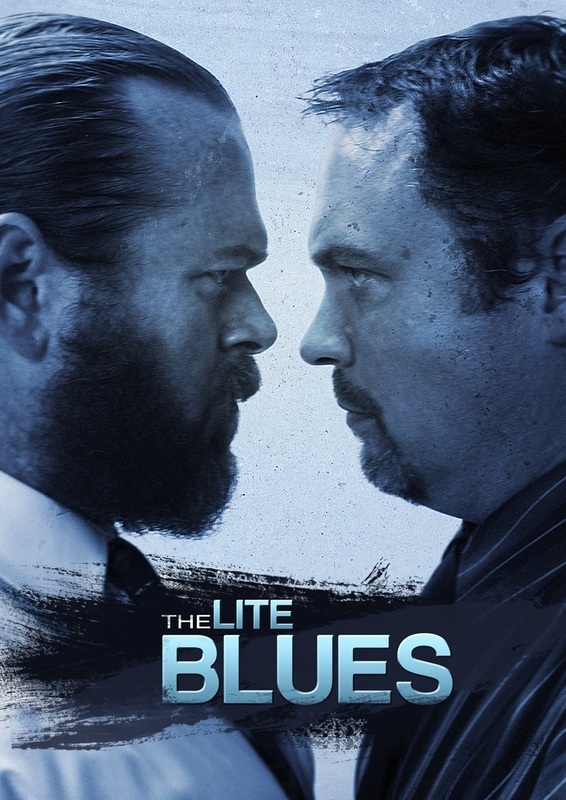 The concept of The Lite Blues originated during filming of the 2012 Emberlense Productions film, They're Coming, in which Jim Elton, Tom Menary, Boyd Rogers and Julian Seager played key cast and crew roles. Rogers and Seager played the parts of Detectives Charles and Davies, establishing a double-act that would be carried over into The Lite Blues. The series was initially mooted as having ties to the fictional universe of They're Coming (the characters of Harrow and Turnbull were referred to as Charles and Davies in early scripts), though they ultimately became two distinct projects, with only certain conceptual elements from They're Coming remaining in the series, as well as a cross-over of actors and crew. The first draft script for what would become "The Slow Method"—episode one of the series—was written by Tom Menary on 9th April, 2012, eight days after principal photography wrapped on They're Coming. 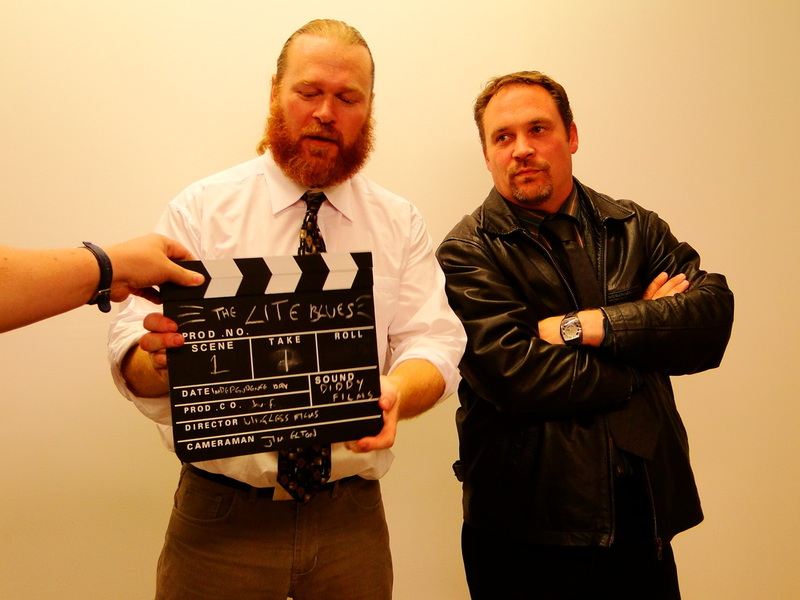 A final, shooting script was completed in early July 2012. Filming on episode one took place in the photographic studio below Dot's Pantry, Torquay, on 4th July 2012, with exteriors shot around the same location. David Burbury completed the series' poster design on 6th July, featuring a still of Rogers and Seager taken following principal shooting. Footage for the second episode, "Dinner Date", was shot in Torquay on 8th July with Rogers. The first episode was released on 14th July, 2012. Boyd Rogers completed a draft on an episode script on 23rd July, which would form the basis for the series' third installment. A production meeting was held with the principal cast and crew on 12th August, to determine the direction of the series, in which Rogers and Seager pitched several episode ideas. The script for episode three was finalized on 23rd August.